The first ever guide to soul recordings, this book - the latest in a popular and well-established series - is an essential purchase for anyone wishing to build up a comprehensive record collection. Each chapter of the Guide provides an essential list of fifteen releases, and a basic list of thirty. The essential releases are those from artists most likely to be recognized by the general public - singers such as James Brown, Aretha Franklin, the Temptations, Marvin Gaye and Stevie Wonder - and they each get extended comments. The basic lists is designed to supplement this and cover some of the 'lesser' artists, and also the tangents and by-ways of the genre - Latin Soul, Low rider music and soul-blues. In its 405 entries, the Guide covers not only music from the golden era of soul - the early 1960s to the mid-1970s - but also the 1950s rhythm and blues that preceded it, and the disco, funk and African American styles which followed. Eight of the leading British and American experts have contributed to the guide, each concentrating on a particular aspect of soul music - whether it be an account of the music produced in a certain region (such as New York, Chicago, the West Coast, the South or Europe), or one of the periods of the style's development. Robert Pruter is the senior editor of social sciences for New Standard Encyclopedia in Chicago, Illinois. He has been a columnist and features writer for Goldmine and since 1985 its R & B Editor. He has been a regular contributor to Time Barrier Express, Juke Blues, Living Blues, Record Collector's Monthly, Illinois Entertainer, Soul Survivor. He is the author of the award-winning Chicago Soul (1991). Geoff Brown is a freelance writer and journalist living in London. He was a feature writer for Melody Maker, editor of Black Music and Jazz Review magazines, and music and senior editor of Time Out magazine. Published books include Diana Ross (1981) and Michael Jackson: Body and Soul (1984, 1988). Bill Dahl is a freelance writer and journalist and a resident of Chicago. He has written extensively on soul and blues for Goldmine, Chicago Tribune, Illinois Entertainer, Living Blues, Downbeat, Guitar World, and many other publications. Dahl was a contributor to a Tina Turner biography, T*I*N*A* (1985), and a co-writer of Rock n' Roll Trivia (1985). Peter Grendysa is a freelance writer from Caledonia, Wisconsin. His articles have appeared in specialist music magazines such as Goldmine, Bim Bam Boom, Record Collector's Monthly, and Yesterday's Memories. He was the principal researcher for the books Top R&B Singles, 1942-1988 (1989), Top Country Singles, 1944-1988, and Top Videocassettes, 1979-1991 (1992). Since 1979 he has been United States liaison for European record companies engaged in reissuing vintage rock and roll, and since 1989 he has been a member of the Awards Committee of the Association of Recorded Sound Collections. Jeff Hannusch is a freelance writer and journalist, and a resident of New Orleans. His articles have appeared in Billboard, Rolling Stone, Juke Blues, Elle, Baseball America, and the New Orleans Times-Picayune, and his liner notes have appeared on releases from Rounder, Rhino, EMI, and many other labels. He is the author of the award-winning I Hear You Knockin': The Sound of New Orleans Rhythm and Blues (1985). Randal C. Hill is a high-school teacher and freelance writer from Upland, California. He is a frequent contributor to Goldmine, and the author of Rock Hall of Fame (1981), Music Hall of Fame (1986), Spotlight on Rock Stars (1989), Superstars of Rock (1989), and the Official Price Guide to Collectible Rock Records (1979-82). He was a contributor to Contemporary Music Almanac (1980/81). Wayne Jancik is a freelance writer and journalist from Chicago. He has contributed articles in all areas of popular music for such publications as the Chicago Sun-Times, Illinois Entertainer, Goldmine, Record Collector's Monthly, and RPM. He is the author of The Billboard Book of One-Hit Wonders (1990). Dan Nooger is an album reissue producer and music business attorney living in Flushing, New York. He has produced reissue albums for the Chess Blues Masters series for All Platinum, the Swingtime reissues for Night Train International, and for various artists on Savoy Jazz and Ace (UK). He has written for such publications as Goldmine, Blues and Rhythm, Shades of Soul, and was a contributor to the Blackwell Guide to Recorded Blues. 1. Rhythm and Blues: Peter Grendysa. 2. New York and New Jersey: Wayne Jancik. 6. The South: Tennessee, Alabama, Georgia, Virginia, the Carolinas: Bill Dahl. 7. The South: Louisiana, Texas, Florida, Mississippi: Jeff Hannusch. 8. West Coast: Randal C. Hill. 9. Great Britain and the European Continent: Geoff Brown. 10. Funk and Later Trends: Geoff Brown. 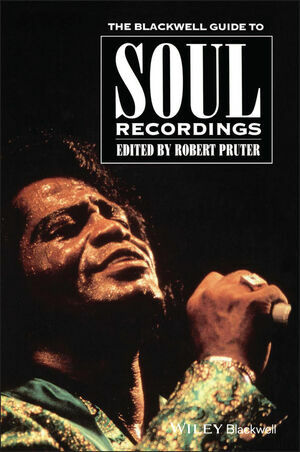 * The first ever guide to soul recordings. * Covers recordings from all over the world. * Includes less accessible, as well as more popular recordings.